Medieval book clasp of Howsam type A.2, dating to c. 1300-1450. 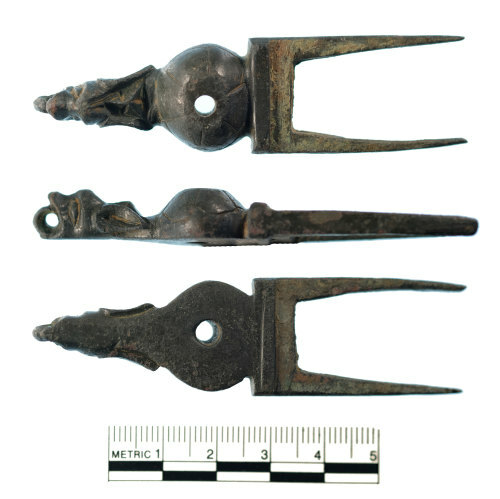 The clasp is made from cast copper alloy and is functionally a strap end of composite 'forked spacer' type (Egan and Pritchard, 1991, 140-146). Two plates, set either side of the fork, form a socket for the strap. Traces of the solder that secured them are present. In front of the fork is a 20.0mm diameter, hemispherical boss, its face marked by six, incised, radiating lines, linked by curved lines. Through the boss is a 3.2mm diameter hole which would have originally fitted over a pin, holding the strap in place around the book. The clasp terminates in a powerful, chisel-cut, animal's head, with long, lentoid ears, flanking a sharply defined, three faced, pyramid. The animal's eyes are also lentoid but set vertically. In its gaping jaws is a 5.0mm diameter loop, which on other examples has held a wire ring. These object are discussed in record IOW-6B705B, a comparable object. Length 79.8mm, Width 22.0mm, Thickness 10.0mm, Mass 38.95g.